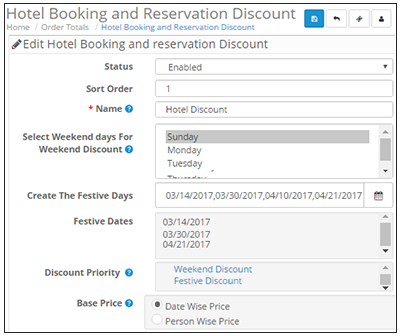 Opencart Hotel Booking Discount: Opencart Hotel Booking Discount module will allow the admin to add discounts on booking and reservation products. 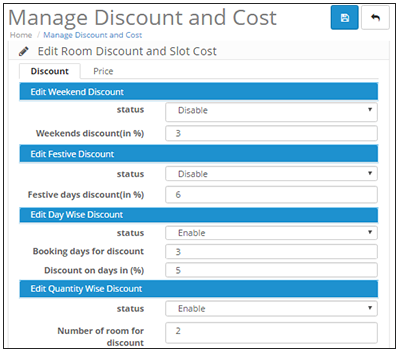 Here the admin can add weekend, festive days, Day Wise, and quantity based discounts. The admin will also be able to create his own week-end & festive days, set the day and person wise price for the bookings and set the priority of discounts as per his own requirement. Weekend Discounts can be applied on the booking products. Festive Days Discounts can be applied on the booking products. 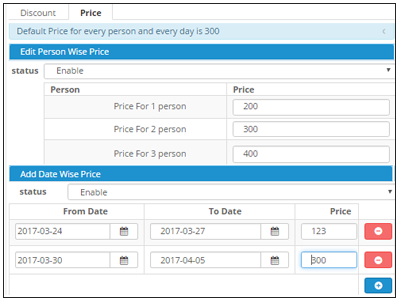 Day wise Discounts can be applied on the booking products. 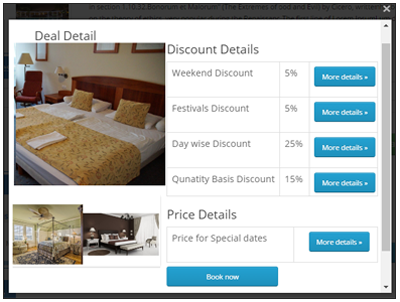 Quantity Wise Discounts can be applied on the booking products. The admin can set the Day Wise Price for the Bookings. The admin can set the Person Wise Price for the Bookings. The admin can set the Priority of the Discounts as per his requirement. The admin can create the Weekend and Festive Days. Enable or Disable the Discounts. Set the Sort Order for the module. Select the Weekend days for the Weekend discounts. Select the Base Price(Selected price will be the base price if the room has both person wise price and Date wise price applied). To manage the discount and price that will be applicable to the bookings, the admin will navigate to Hotel Booking and Reservation -> Manage Discount and Price. The page that opens up, here the admin can configure the Discounts for – All the Booking Products that he has created and can edit the discounts for the Discountable Products. Now, after clicking the edit button for the bookings the admin will find two tabs to manage the discount and price. Day Wise Discounts(you can also add the number of booking days for discount). Quantity Wise Discounts(you can also add the number of rooms for discount). Person Wise Price of the room. Date Wise Price for the booking. See the Deal details and more details for each of the Discounts. See the Discount applicable after adding the booking to the cart. See the discount applicable on the Order Page and on the Order Information. Did you buy Opencart Hotel Booking Discount?